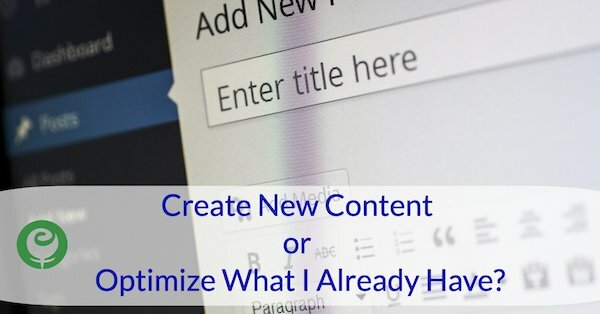 Should I Create New Content or Optimize Existing Content? So, you’re ready to kick it up a notch with your online marketing efforts. You have a pretty good website. You’ve been posting to a few social media platforms. You have a pseudo-regular email campaign. You’ve created some videos and tried some Facebook ads, too. You decide you really want to kick it into high gear and make the most of all that you are doing online, but where do you start? B.) Pause on new content creation for now, and figure out what you’re doing well, what needs to be improved, and spend time making the most of what you already have. You probably guessed it already, but the answer here is B. 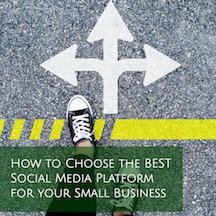 As a busy small business owner, you are better off to optimize what you already have – which will in turn help you to better understand platform best practices – before you start generating more content. When I work with clients on their social media and online marketing, the “clean up”, planning, and strategy that needs to take place usually falls into 4 categories: website and profile optimization, search optimization, content mix & repurposing, and advertising. When you are working to optimize your existing online marketing presence, you should analyze and review what you already have by considering the points below. Review your website pages for correctness and completeness Is the information on your business’ site still correct? When is the last time you swapped out your images? Do all your prominent links still work (e.g. social media icons, footer links, newsletter opt-in, key links on your home page)? Are your products or services pages outdated? Is your “meet the team” page representative of the team of people you have working for you right now? Websites are something that constantly evolve. You may have hired new staff, introduced new services, changed your pricing, or collected new testimonials to share. Your website is your “home base” online so make sure it is current and representative of your company in its most current state. Gave your site a “once over” while thinking like a customer We are the center of our business as business owners. That means everything we are writing or publishing makes total sense to us. But that doesn’t mean it’s the best or most user friendly approach for our customers. Simple things like including an About page, making sure contact information is easy to locate, that product or service pages are complete and detailed, or making sure that a customer’s first impression on your home page “tells” them exactly who you serve, what you do, and how you help, is key. Review your competitors’ websites and profiles Do you have a competitor that is doing a better job at selling their products or services than you? Are they making it easy to buy from them? Are they providing tools or resources you aren’t that will aid a customer in their buying decision? Are their products or services offered in other ways or quantities that better fulfill a buyer’s needs? You don’t want to copycat, but competitive intelligence is important. Review your social media profiles for correctness and completeness This includes your social media bio, profile photo, cover photo (Twitter, Facebook & LinkedIn), contact info, and emoji use (Instagram). You can’t control how someone will first come in contact with your brand online. If a potential customer lands on a social media profile instead of your website, what would their first impression be and can they easily find their way back to you if needed? SEO on your website and for your blog posts is absolutely critical. Start now learning the basics of SEO and how to implement SEO on your website and blog. SEO is very much a learned skilled; the more you practice, the better you get. There’s a lot the average small business can do by performing Google keyword research, writing custom title tags and meta descriptions, and adding ALT tags to their images. In addition to website SEO, also critical is the optimization of things like your social media profiles (your social media bios are what can get your business to rank high in search), your Instagram posts (thanks to solid hashtag research and use), your Pinterest boards and pins, your Google My Business listings, and your YouTube video tags. It’s awesome that you are pinning new content from your website everyday, but if people aren’t finding those pins in Pinterest search, then how helpful is that? Videos are an amazingly popular and powerful form of content, but if they are sitting in your YouTube channel, un-viewed because you haven’t learned how to optimize your video title, description and tags, then it’s almost like you didn’t make the videos at all. The more social media evolves, the more search optimization of your content is critical to online success. When it comes to the content you are producing and sharing as part of your online marketing, it’s really two-fold. Your overall mix of content You can’t be all promotional all of the time, so what other types of things that are relevant and complementary to your ideal customer makes sense to be part of your content mix. Industry news, national trends, humorous memes or videos, employee and behind the scenes photos and scoop, customer testimonials and user-generated content, and events in your local area are all great options for additional types of content. Use 1 piece of content that you produce in multiple ways For example, your new blog post can be fresh content to post to all your social media profiles as well as content for your next email newsletter, in addition to providing another link to drive traffic back to your site. Your new video can be used on all your social media profiles, as an ad, and embedded into your next email newsletter and blog post. Don’t make it harder on yourself. Instead, make an overall marketing strategy that incorporates all of these things and make a master plan as to how to get the most mileage out of every new piece of content. Is the ad type you are running the best for the ad’s goal? If you are using the blue Boost button that’s located on the published Facebook post, you are running an engagement ad. This is great if you want people to click Like on your post or leave a comment. But this isn’t so great if your desired action is to get people to click a link or convert on an email opt-in or sale. Have you optimized your image and ad copy for mobile? Mobile use is higher than desktop use pretty much across the board. If you aren’t previewing your ads in the mobile view, you don’t know what they may look like when being shown to mobile social media users. Have you created custom audiences of your website visitors, people who engaged with your Page and your email list? Not all of these options are available on every social media platform, but you get the idea. Facebook and Instagram allow you to create custom audiences of people who engage with your account, you can capture website visitor traffic for advertising use on Facebook, Instagram and Pinterest, and these platforms also allow you to upload your list of email contacts to advertise to as well. The lesson here is if you aren’t advertising to people who already have some type of awareness of your brand (i.e. a “warm audience”), you’re missing out. Have you checked your placements? Facebook may say that All Placements is recommended, but it’s not! Click to edit placements and select only “Feeds” (which means the mobile and desktop news feed). Also, if you are advertising on Instagram, create an ad just for that. Facebook doesn’t evenly split the total ad budget between Facebook and Instagram placements, and you’ll end up with almost all of your budget being spent on Instagram. Have you tested your keywords and targeting? Pinterest provides keyword phrase data so you can see which keywords phrases are performing the best for your ad and then can tweak future ads based on that. Facebook (and in turn, Instagram, since Instagram is owned by Facebook) provides a plethora of targeting options. Go beyond broad, general topics to drill down more directly to the people you want to reach most. In addition to demographics info, you can target fans of competitors’ Pages or people who like Pages related to your business. This post was written as an overall way to diagnose strengths and weaknesses of your current online marketing presence, and the types of things to consider when evaluating your effectiveness. In addition to reviewing your online marketing from a content and optimization perspective, be sure you are utilizing your various analytical tools for deeper insights. Google Analytics is a free tool to install on your website for website data, while each popular social media platform also offers its own platform analytics for business accounts.